Or should that be ‘goes unliving’? It’s hard to know. Mad King Thorn seemed very much alive when he last visited Tyria for the Halloween festivities, but that was 250 in-game years ago – rendering him very much dead, by conventional standards. Something tells me, though, that he’ll be putting in an appearance regardless at some point in the next week. Shadow of the Mad King will be a week-long event “in four acts”, made up of new dynamic events, mini-games and decorations. Most importantly, though, it sees the launch of ArenaNet’s paid-for PvP tournaments; a key step in ArenaNet’s slow-burn plan to make Guild Wars 2 an eSport. Much like the free automated tournaments already available in-game, these are five-on-five affairs. Unlike the free tournaments, you’ll need to pay your way by buying tickets at the gem store. First and second placed teams emerge with glory, rank points and gems. ArenaNet expect that the very best players will make a profit this way through PvP. There’s plenty of event-specific silliness going on too, of course. Festive tat is to fill up the shelves of the Black Lion Trading Company, the store accessible anywhere in GW2 via the default hotkey, ‘O’. Included will be costumes and transforms which can be used to play Costume Brawl, a PvP combat mini-game and long time Guild Wars tradition. Also turning up in a plastic maskand a capeare new mini-dungeons, bosses, achievements and, delightfully enough, jumping puzzles. 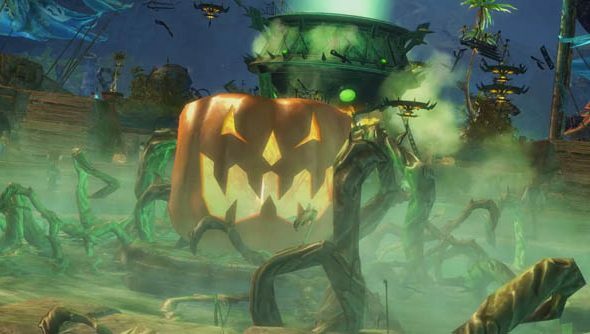 In Guild Wars lore, Halloween is the time when boundaries between the realms are at their weakest. It’s tourists from the netherworld, then, who are going to be making the week October 22nd to 31st so eventful.